Espoo is the second largest city and municipality in Finland. 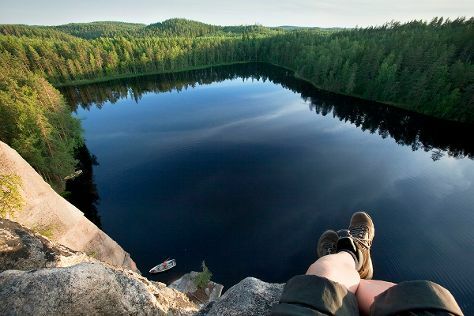 Start off your visit on the 12th (Fri): explore the striking landscape of Nuuksio National Park. 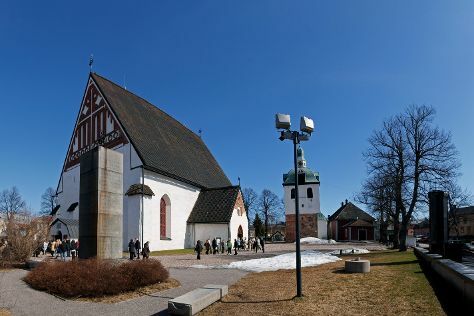 Keep things going the next day: look for all kinds of wild species at Laajalahti Nature Reserve, contemplate in the serene atmosphere at Lohjan Pyhan Laurin Kirkko the Church of St Lawrence Lohja, and then take in the architecture and atmosphere at Kirkkonummen kirkko. To see photos, other places to visit, traveler tips, and other tourist information, go to the Espoo day trip planner. Tel Aviv, Israel to Espoo is an approximately 9-hour flight. Expect a bit cooler weather when traveling from Tel Aviv in July: highs in Espoo hover around 26°C, while lows dip to 14°C. Finish your sightseeing early on the 13th (Sat) to allow enough time to drive to Porvoo. To find where to stay, other places to visit, reviews, and other tourist information, read Porvoo online trip builder . Getting from Espoo to Porvoo by car takes about an hour. Other options: take a bus. In July in Porvoo, expect temperatures between 24°C during the day and 15°C at night. Wrap up your sightseeing on the 14th (Sun) early enough to drive to Kouvola. Kouvola is a town and municipality in southeastern Finland. 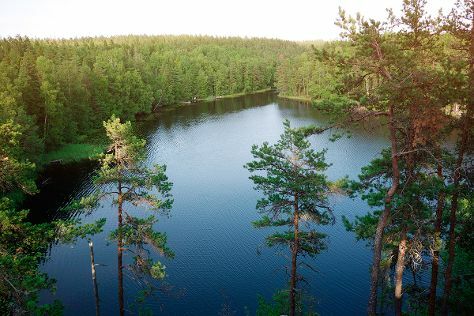 You've now added Repovesi National Park to your itinerary. Kick off your visit on the 15th (Mon): explore the striking landscape of Repovesi National Park. On the 16th (Tue), you'll have a packed day of sightseeing: admire the landmark architecture of Hamina Fortress, contemplate in the serene atmosphere at Saint Peter and Saint Paul Cathedral, then take in the architecture and atmosphere at St. John's Church, then identify plant and animal life at Riverside Park, and finally identify plant and animal life at Arboretum Mustila. To see reviews, other places to visit, where to stay, and other tourist information, you can read our Kouvola trip planner . Drive from Porvoo to Kouvola in 1.5 hours. Alternatively, you can take a bus; or do a combination of bus and train. In July, daily temperatures in Kouvola can reach 24°C, while at night they dip to 14°C. Wrap up your sightseeing on the 16th (Tue) to allow time to take a train to Lappeenranta. 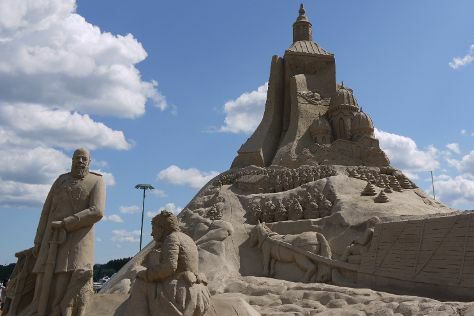 Start off your visit on the 17th (Wed): head outdoors with Atreenalin Seikkailupuistot, take in the architecture and atmosphere at Lauritsala Church, then take in the spiritual surroundings of Lappeen Marian kirkko, and finally explore the historical opulence of Sandcastle Lappeenranta. To see ratings, photos, more things to do, and other tourist information, you can read our Lappeenranta trip itinerary tool . Getting from Kouvola to Lappeenranta by train takes about an hour. Other options: drive; or take a bus. In July in Lappeenranta, expect temperatures between 24°C during the day and 15°C at night. Finish your sightseeing early on the 17th (Wed) so you can drive to Savonlinna. Start off your visit on the 18th (Thu): step into the grandiose world of Savonlinna Cathedral, look for gifts at Taito Shop Savonlinna, take in the architecture and atmosphere at Pikkukirkko, then explore the historical opulence of Olavinlinna Castle, then examine the collection at Savonlinna Provincial Museum, and finally take in the spiritual surroundings of Kerimaki Church. 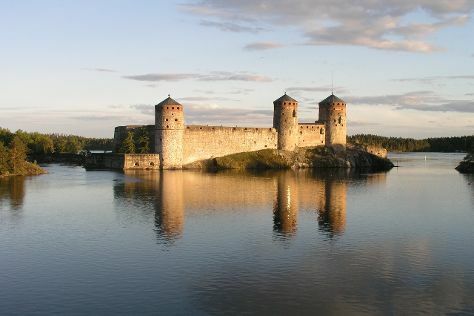 To find where to stay, more things to do, ratings, and more tourist information, read Savonlinna day trip planner. Drive from Lappeenranta to Savonlinna in 2.5 hours. Alternatively, you can take a train; or take a bus. In July, plan for daily highs up to 24°C, and evening lows to 13°C. Finish up your sightseeing early on the 18th (Thu) so you can travel to Koli National Park. Start off your visit on the 19th (Fri): delve into the lush surroundings at Patvinsuon Kansallispuisto. For where to stay, maps, other places to visit, and more tourist information, read our Koli National Park road trip site . Traveling by car from Savonlinna to Koli National Park takes 3 hours. In July, daily temperatures in Koli National Park can reach 24°C, while at night they dip to 13°C. Finish your sightseeing early on the 19th (Fri) to allow enough time to travel to Tampere. Start off your visit on the 20th (Sat): enjoy the sand and surf at Rauhaniemi Beach, take in the spiritual surroundings of Tampere Cathedral, and then look for all kinds of wild species at Hatanpaa Arboretum. To see other places to visit, photos, where to stay, and tourist information, refer to the Tampere tour itinerary planner . Getting from Koli National Park to Tampere by car takes about 6 hours. Other options: fly. In July, daily temperatures in Tampere can reach 24°C, while at night they dip to 13°C. Wrap up your sightseeing on the 20th (Sat) to allow time to take a train to Helsinki. Start off your visit on the 21st (Sun): take a stroll through Katajanokka, then contemplate in the serene atmosphere at Rock Church, then take an in-depth tour of Seurasaari Island and Open-Air Museum, and finally get a dose of the wild on a nature and wildlife tour. Get ready for a full day of sightseeing on the 22nd (Mon): explore the wealth of natural beauty at Sipoonkorven Kansallispuisto. To see where to stay, more things to do, other places to visit, and other tourist information, you can read our Helsinki online trip maker . Traveling by train from Tampere to Helsinki takes 2 hours. Alternatively, you can drive; or fly. In July, daily temperatures in Helsinki can reach 25°C, while at night they dip to 15°C. Finish your sightseeing early on the 22nd (Mon) to allow enough time to travel back home.